Are you busy? 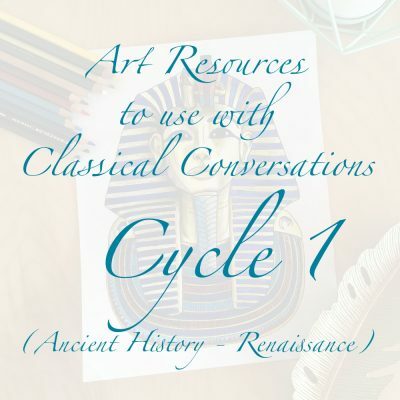 Planning art projects that focus on the fundamentals (the grammar) of art and also align with the Classical Conversations Foundations Guide takes hours of time. However, there’s no need to spend your limited free time reinventing the wheel by writing art lesson plans. I want to give you my complete art lesson plans for your CC community so you can reclaim your time. I get it, I’ve been a Classical Conversations SR, Director, and Foundations tutor myself and plenty of my evenings and weekends have been anything BUT relaxing. However, your experience doesn’t have to be that way! I’ve created fun and easy art lesson plans and pulled together an organized, succinct shopping list just for you! No need to re-invent the wheel- I’m sharing all my lesson plans with you here, so you can relax too! You’ll find the answers to several Frequently Asked Questions near the bottom of this page. Your Amazing Aritists material for Cycle 2 was wonderful! I printed the material, with the additional pictures, into a spiral bound book and used it for our Art lessons. The book was beautiful, had a custom cover made, it was easy to copy so my daughter could do lessons and then “color” on top of and trace the artists pictures herself. This was a treasure trove of quality collected materials! We’re looking forward to seeing your materials for Cycle 3! I absolutely LOVED the cycle 2 great artists set. SO helpful as a CC Foundations director. I loved how you have a few project options, based on age level. It was so helpful to just have everything we needed to cover in one spot! 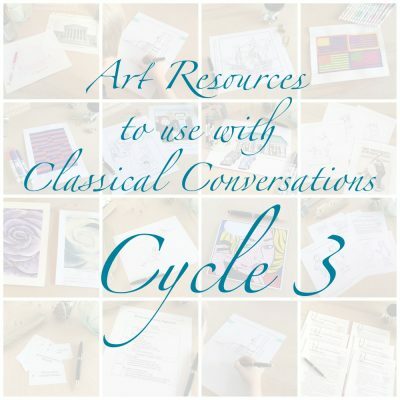 I loved the convenience of the Art lessons for last cycle, and I am SO excited that you will have lessons for Cycle 3! I will definitely be purchasing those! What ages are your lesson plans written for? The lesson plans are designed for 4-12 year olds, although I think older students and adults would enjoy them too. This is possible because every lesson plan includes options for scaling it up and down to fit the skill level and passion of your students, because it’s not all about age. Our CC community had the full 4-12 year old age range last year and it looks like we will again this year. Last year I gave my lesson plans to my tutors and then encouraged them to do what would work for their class. Often they chose to have two levels available and let each student choose. They’d say something like: “You get to choose if you want to start with a pre-drawn picture and focus on painting or draw your own picture to paint!” It seemed to work great with the 4 year olds and the 12 years. Are these art lesson plans classical? Yes. These art lesson plans are designed for the grammar level of art. They focus on learning about people, art terms and basic techniques. They include references to help you, the teacher, integrate them with other subjects as often as possible. Are these art lesson plans “stick-in-the-sand” simple? Yes, although I’ve found stick-in-the-sand means different things to different people. In her 2012 Writer’s Circle article, “Stick in the Sand: The Place of Technology in Community,” Leigh Bortins uses it to mean that we don’t need expensive technology to teach our children. In the CC community it has also evolved to mean that education does not need to be complicated, so look for ways to make homeschooling simple and doable. If you have the existing knowledge of art or you have the time and the passion to teach yourself about art, I’m confident that you are fully capable to teach art without formal lesson plans. In that case it may feel simpler to you to do it yourself and not mess with lesson plans. 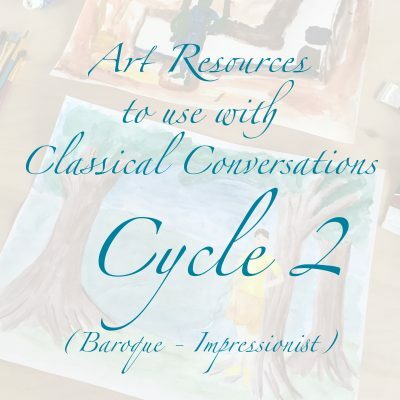 If, however, you don’t already have knowledge about art or don’t have both the time and the passion to teach yourself the grammar (fundamentals) of art, then my lesson plans are a great way to simplify the process of teaching art. You can use my lesson plans to learn along side your students, with minimal preparation on your part. Does my friend need to buy her own copy or can I share these lesson plans with her? Thank you so much for helping me protect my copyright on these lesson plans. Whether you’re a Director or Tutor at your homeschool community, when you purchase my lesson plans you have permission to share paper copies with all the tutors/teachers in your single homeschool community! Please do not give these lesson plans to others. Instead, share my website with them so they can purchase their own copy. Why don’t you use "Discovering Great Artists" by Kohl and Solga? I don’t have anything against the book, Discovering Great Artists. If you’re look for a book of fun crafts, it’s great. However, it doesn’t seem to use the classical model of education and it doesn’t feel like an art curriculum. Don’t get me wrong, I love crafts and I have enjoyed doing some of the crafts in that book! However, I want more for the short thirty-minute time slot we have for art in our CC community. I want to use what I know about the classical model to give our students a strong foundation in drawing and painting. I want them to learn interesting information about the world’s great artists integrated with other subjects, I want to introduce them to the major movements in art history, learn some basic art vocabulary, and work on projects that reinforce these concepts. I’m so glad CC gives directors a lot of flexibility in this area so we can make the most of our fine arts time. I'm a little lost- how are your lesson plans organized? For each art project you’ll find a blog post explaining some of the back story, my personal opinions, and photos I took while creating this lesson. I try to show a sample of the completed project here as well. You’ll also find a product page for each lesson plan, showing the details of what is included in each lesson. Every lesson plan includes a short script for tutors, detailed art project instructions, modifications for various skill levels, and some extras that vary from lesson to lesson. Amazing American Artists (Weeks 13-18 in CC). You can purchase each lesson individually for $4.99 or purchase a 6-week package at a great discount, plus a few bonuses.